Curator Richard Teitz organizes the layout for the “Do I remember The Alamo?” exhibition. 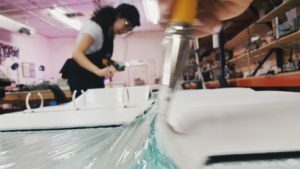 Perhaps the word “mini” deters people from believing the art is produced by established artists and that the museum exists in a physical context, but the MINI ART MUSEUM (MAM) is a place much larger than meets the eye. The MINI ART MUSEUM exists in a time where accessibility to art in schools and the community is essential to growth and understanding. It brings the arts to YOU, offering a unique experience that San Antonio has never seen or had access to before. Public school teachers often do not have the time necessary to take a class full of children away from their busy curriculum, let alone the funding needed for buses or other modes of transportation to get their classroom to an art museum. MAM is an affordable and transportable alternative that brings the same sense of wonder and creativity that a museum holds. 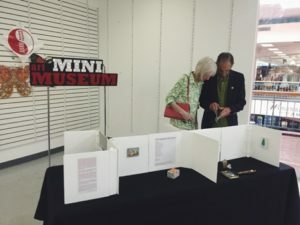 But what IS the MINI ART MUSEUM? Who works behind the scenes to make it happen? Painting binders used as gallery walls for exhibitions. 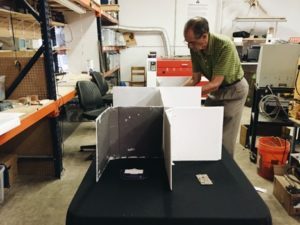 Working as an intern for the MINI ART MUSEUM this summer has introduced me to various practices and procedures that are required for the production of a gallery or museum exhibition. As a was a part of SAY Sí for the majority of my life, I had been a part of a few exhibitions installations previously, but I had never had the opportunity to work so closely with individual artists and curators. July 29, 2016: opening reception of “Do I remember The Alamo?” at Wonderland of the Americas. The process begins with the introduction of a curator, the creation of the exhibition genre, and the selection of the artists. Richard Teitz, former director of the Alamo, was chosen as the curator for our “Do I remember The Alamo?” exhibition. The opportunity to speak and work on a show with someone who had been so closely associated with the subject of our exhibition was a truly unique and valuable experience.